Metal futon bunk beds are so practical, they serve as a bed at night with enough room to sleep 3 and they provide a daytime couch bed. Perfect for small apartments, dorm rooms, teen rooms, or any place where night time sleeping space needs to be converted to daytime seating. A metal futon bunk bed is a simple style that fits into most decors. Metal futon bunk beds are considered couch bunk beds. The sturdy steel frame makes these couch bunk beds durable to withstand adult weights. The twin bed will withstand weights up to 250 lbs and the full size futon couch bed will withstand weights up to 300 lbs. Full length guardrails and fixed ladders provide added safety features. A powder coated finish will withstand years of use and still look new. 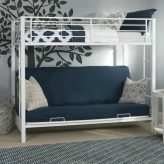 The simple, clean, contemporary design of a metal futon bunk bed blends easily into most decors. 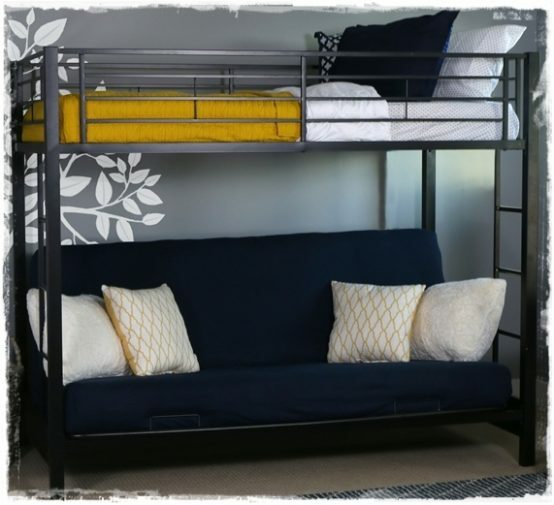 Turn your teens bedroom into a teen hangout with our metal futon bunk beds!